NOTE: 3/4" and 1-1/2" require only one seal with the use of the reducer ring. NOTE: Do not loosen too much as the cap could disengage from threads. The cap removal tool is not designed to break the cap loose. Note: The ¾" and 1 ½" service tee requires a reducer ring between the single seal and packing retainer/cap housing. Place the reducer ring inside the housing with the o-ring mounted upward. Note: Tools with side buckles must have the safety strap secured to the buckles and tightened. 6. Using a 9/16" wrench, slowly tighten packing retainer nuts evenly while ensuring the packing retainers are moving upwards into retainer housing. Be sure to keep entire tool raised up under service tee cap. 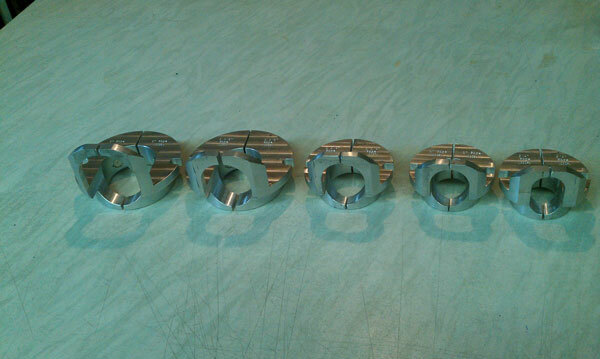 Tighten packing retainer nuts until the tool is secure on the service tee. Do not over-tighten. 7. Turn expandable plug tool handle clockwise while holding the tool shaft, until tight. Allow expander plug to set for two to three minutes, then retighten to ensure plug is set tight. 12. Remove Safe-T-Stopper® tool if the service tee is to be removed. 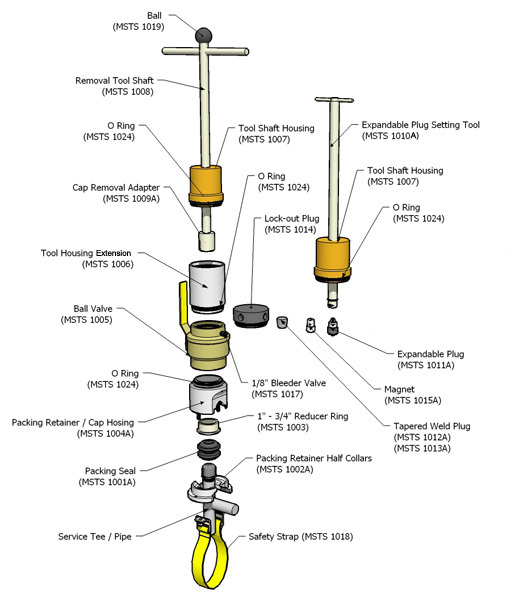 Do not remove Safe-T-Stopper® tool if service tee is to be put back in service. Note - Companies that wish to remove the service tee by cutting off below the branch must ensure the expander plug is set sufficiently to remain in the service branch, and follow their own written procedures for tee removals. Higher pressures and contaminants on the pipe wall could affect the integrity of the expander plug retention. 4. Place properly-sized tapered plug into the service tee stub above the expandable plug (Fig. 11). Be sure of correct fit due to different service tee wall thicknesses (Sch 40, Sch 80, etc.) . To Put Service Tee Back Into Service or Capping Branch Only.